Of the six-point big eyes, only this one and rectangular six in the corner can be killed. Its vital point is a. It is known as the rabbitty six  or nutcracker. It is also known as the flower six, a direct translation of the Chinese and Japanese terms for this shape. Almost filled to a crossed five. A rabbity six nakade can be almost filled to a crossed five (as shown) or a bulky five. The term "rabbitty six" was invented by James Davies. The shape vaguely reminds one of a rabbit's head; the ears are at the top left. Robert Pauli: Did James really have the (t)y? In German the adjective-noun form sounds funny to me (hasige Sechs...ouch, not a hare, a bunny: karnicklige Sechs). BTW, is 'bunny'' also usable as adjective? My favorite name for this shape is fish(y) six - makes sense in all directions. Later...hmm, why not piranha six? cartan: Davies calls it "rabbity six" (one t). C.S. 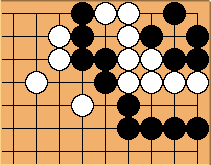 Graves: In his Graded Go Problems for Beginners books, Kano Yoshinori refers to it as the "Flowery Six". anonymous: In Japanese it is called hana roku, literally flower six. I think rabbity six is pretty silly, especially since there is no English word "rabbity"
rabbity, a. Abounding in rabbits; somewhat like a rabbit. Also, suggestive or characteristic of a rabbit. Also Comb., as rabbity-faced, -looking adjs. Pledger: I like the fishy six idea. The shape reminds me of those little goldfish crackers. Also, the common meaning of the word "fishy" (inspiring doubt or suspicion) works well here. anonymous: Why don't we just call it the flower six? To me, it makes sense to use the same name as in Japanese and Chinese, instead of making up a new one. afellig: Fishy six is a good title because it is representative of the shape while at the same time has a negative connotation that can help beginners remember that it is a dead shape. fishbulb: um... is there any difference between this shape and the dumpling shape? looks identical to me, but with a silly name. weston: A dango, or "dumpling shape," is more general but refers to a mass of stones without eyes and few liberties. 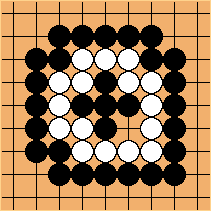 A dango of six stones could be arranged in the same way as the empty points on a flower six, but not necessarily. 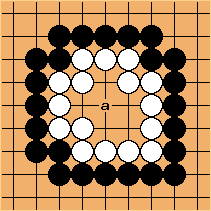 nowei: The Chinese 葡萄六(pu2 tao liu4) means "grape six", I assume this is partly because of the general shape but probably more because the killing move in the center resembles the seed of a grape. Grape six doesn't sound very cool though. For other six point eyespaces, see Rectangular Six and Rectangular six in the corner.